LEFT: Animated picture of an application of Baguazhang Golden Pheasant Spreads Wings. This application is from the Jiang Rong Qiao system of Nei Jia kung fu, which includes Xingyiquan, Baguazhang and a version of Taijiquan. Baguazhang and Pa Kua Chang are different English translation schemes for the same "Eight Trigrams Palm" martial art. The chart summarizes the development of the eight trigrams and examples of their various associations. There are two major arrangements of the these symbols as indicated by the above Pre-Heaven and Post-Heaven trigrams, each with separate progression sequences. The Baguazhang trigrams are believed to have followed a separate philosophical development from the Five Elements (or Five Phases) although they both originally appear to have been based on the cyclical and seasonal study of Five Stars in the sky. Both of these schemes track progressions between components. The trigrams eventually linked to the "I Ching" and to Chinese fortune telling thought to be developed mostly by early Daoists. Daoism, is central to the development of Zen Buddhism, which is different from Chinese Buddhism. (More on this can be found in the great book the "Tao of Zen" by Ray Grigg.) However, connection with the "I Ching" and mysticism might lead one to the mistake of dismissing the trigrams as only being used as methods of fortune telling and magic. Even the early Daoists shunned the over emphasis of such matters. Many interesting correlations and relationships can be found in the symbols. The permutation sequence in the trigrams is directly associated with the mathematics underlying probability and statistics. The trigrams can also be linked to the mathematics of group theory. Physicist Murray Gell-Mann called his group theory development of quark theory "the Eight-Fold Way," with an eye to the Chinese philosophy underlying the trigrams. The group theory perspective provides a systematic progression for training internal martial arts. This traditional approach fosters building a balance between various aspects of an art. Each of the main Chinese internal martial arts build on this dual foundation of both the trigrams and the Five Elements. An older name for T'ai Chi Ch'uan (Taijiquan) was "Eight Doors, Five Steps," reflecting the importance of both the Eight Trigrams and the Five Elements. Xingyiquan (Hsing I Ch'uan) has developed with particular focus on the Five Elements, and their original polar view, as well as the later more sophisticated view of the creation and destruction aspects. The name Baguazhang itself translates as "Eight Diagrams Palm," reflecting the central importance of the Eight Diagrams (or Trigrams) in the martial art. So the study of the Eight Trigrams, their progression, as well as the origins is beneficial for deepening understanding of the martial art's application and underlying principles. A progressive study of the internal martial art of Baguazhang can be viewed as matching their movements categorized by Yin and Yang aspects. One horizontal continuous line represents Yang, and splitting in into two segments represents Yin. Other Yin and Yang characteristics of the movements are built up by adding more unbroken or split parallel lines to these basic aspects. For example, (Fire and Water), followed by adding 3 parallel lines (Lake, Thunder, Wind, and Mountain). In this way, the practitioner of Baguazhang is introduced to a process where basic energies become layered with never-ending possibilities. Although the Eight Trigrams and the Five Elements are both core ancient Chinese philosophical systems that were believed to be originally developed separately, they seems to be mutually compatible. The more modern development of both systems seem to have been intertwined. From just the study of the trigram lines and their progression, the practitioners of both Baguazhang and Xingyiquan might well wonder about the development of their arts. Which has the deeper roots - the Baguazhang's palms based on the Eight Trigrams or Xingyi's Fists based on the Five Elements? It's also no surprise that with the closely knit philosophical origins of both Bagua and Xingyi, that it is not unusual to see students of both disciplines crossing over and studying the other's art. The art of Baguazhang, or the practice of Bagua as a martial art, can be as complex as the early documents providing insight (i.e. Tao Te Ching, I-Ching...). However, instead of a theoretical evaluation of useless possibilities, Baguazhang lives and breathes martial applications and results. In Jiang Rong Qiao's (a third generation practitioner of Dong Haiquan's lineage) system of Baguazhang, the emphasis of this complex system lies in a combination of both the polar and cyclical concepts creating a web of intricacies that are built on symmetry. 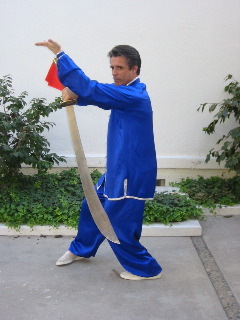 In fact, the Bagua Sword of Jiang Rong Qiao calls on the practitioner to not only engage in the study of the art of swordsmanship with one hand (which many systems have moved to), but to develop the use of both hands equally with a foundational study arranged in a lengthy, intricate, completely symmetrical form. Mastering Baguazhang requires a deep understanding of the trigrams, and their relationship to each other from both the polar and cyclical points of view. Until these two systems withi Baguazhang are combined in the practice, the basic seeds of rolling, drilling, pressing, wrapping, yin and yang, spiraling, rootedness, and intention will not take hold in the practitioner's being. Instead, the practice of Bagua will likely meander along aimlessly relying on previous experiences, guesswork, and lacking any specificity or sophistication. The basics of Bagua are learned by both evaluating and sensing how various angles and geometric shapes are formed by the individual's interaction with first the circle then the opponent. The practice is internalized when the practitioner is able to connect and interact with using movements that are almost effortless. The internal art of Bagua is driven more by structure, sensitivity and centrifugal force than by speed, guesswork and brute force. Many Baguazhang Masters from Dong Haiquan on have so effectively developed and mastered the understanding of the trigrams and their relationships to create innovative styles and systems. The approach is to create specific frameworks for dealing with complexity. The structure that might initially seem confining is actually a matrix for intuitively recognizing patterns and dynamical situations. The complete picture of Baguazhang is all about the mastery of the underlying structure as a jumping off point for the practitioner to embrace self actualization and exploit the processes of change. The idea that Baguazhang is an insolvable Chinese puzzle should be avoided and dismissed. Like other internal martial arts, such as Taijiquan and Xingyiquan, Baguazhang is an art with specific, in-depth rules for life-long learning that train the practitioner to become efficient and precise. Efficiency and precision lie at the nucleus of its practice. Of all the Chinese internal martial arts, Bagua is one of the most easily converted from an internal art to an external art. External martial arts train speed and power directly. The internal aspects of the art are often ignored in Bagua because the speed that is picked up through centrifugal force can be seductive. Just as an early focus on obvious power training leads Xingyiquan players onto an external path, speed for its own sake can be attractive to the Bagua practitioner. A myopic focus on speed is a distraction from the internal martial arts path of the development of specificity and sophistication. Pursuing the desire for speed has instant gratification that comes at the cost of other more long term, subtle development. Bagua's deepest roots are in meditation and softness combined with the angles that comprise a circle, which when harnessed create a centrifuge of momentum that is at times more like the ebb and tide of waves and at other times like a top. Performing large Bagua movements at speed can sometimes lead the practitioner to ignore the value of the smallest of movements or the lack of movement, which as an associative property is found in standing meditation. On the other side of the coin, because Bagua employs unique training methods not found in other internal arts such as Taijiquan or Xingyiquan, the impatient either throw up their hands in disgust or they even throw out what they can't do and introduce more of their own ideas. Either choice prevents them from making further developments both in the art and within themselves. An example of this is the Tang Ne Bu (Sliding in the Mud) Step. This step is so crucial in the practice of Baguazhang, that this author seriously feels that the complete idea of Yin and Yang in Baguazhang can never be fully realized without it. There are other steps utilized in Baguazhang such as: Box Stepping, Turning In, Turning Out, Crane Stepping, Chicken Stepping, etc. However, all of them take their lead from the Sliding in the Mud Step. In fact, the Sliding in the Mud Step itself is the most direct correlation to Yin and Yang that can be found in any stepping method in many of the internal martial arts. With the way the Yongquan (Running Spring) point leads the step itself, it's easy to see that once the step is attained, more chi (or vital energy) can be cooked up with it, as well as an enormous development in one's balance -- especially if the step is performed slowly and the ankle relaxed during the act of sliding. Furthermore, the training of devastating shin kicks, ankle stomps, and a barrage of leg sweeping techniques is naturally derived from Bagua's basic, main step, the Sliding in the Mud Step. Unfortunately, there is a ridiculous notion in some places in the west, (likely developed by those who can't do the step or don't want to try), that the Tang Ne Bu was forced on practitioners by the communists. Furthermore, what is demonstrated by some of these self-proclaimed masters of the art is nothing more than T'ai Chi stepping attributed to this Mountain or that Mountain or that Dragon or another Baguazhang that no one (except for a few in that school) have ever heard of. These are the same teachers who would lead people to believe that their Master, who escaped into Taiwan or the West, is the only one with the real stuff: the only one out of the billion people who remained and are still in China today. While only a very small percentage of the billion people in China are Bagua practitioners, they still make up a large number. The multifaceted nature of the way Baguazhang has been passed down through various teachers also makes any claims that any single school is carrying on the only true system of Baguazhang simply unbelievable and absurd. Beyond the foundation of the steps, and the body of angles and circular relationships, Baguazhang is characterized by an emphasis on the shapes of palms themselves. This knowledge rests at the pinnacle in carrying forth Bagua as a martial art. Simply put, the palms are what make Bagua work. Each palm has a corresponding trigram, and the practice of just the palms is found in the "Mother Palms," or Bagua Mu Zhang, practice or sometimes referred to as a part of the Chi Kung of each Bagua style. The palms are both the basic and the advanced understanding of the art. The sophisticated development of the palms is the product of many years and many teachers. This development took the basic of the Mother Palms of each of the respective systems and created "styles" of Baguazhang. The styles each synthesize the basic palms with the polar and cyclical aspects of the trigrams in somewhat different contexts. Regardless of the context, if the palms are taken out of context and the principles of the footwork are neglected, what is left is likely to be ineffective. When the basic practice is allowed to become disconnected, it is likely to make the journey longer and more difficult even though the distance traveled will be less. One integral part of the internal training in the principles of Baguazhang is the practice of Rou Shou (or Soft Hands). In all the styles of Baguazhang, Rou Shou is often exemplified by two person practice, and is performed with fixed steps, moving predetermined two man forms, or free style. Bagua Rou Shou often employs joint hand drills with another person, which on the surface appear to be similar to Tui Shou, or Push Hands, that is a cornerstone in the training in both Taijiquan and Xingyiquan. Baguazhang does have Push Hands practice, but the practice of Rou Shou is meant to take the practice a step further in engagement. The beauty of Rou Shou is that you can adapt your practice of the art into more true to life situations that call on a response to the unpredictable. Training in this manner leads to not only obvious, useful fine tuning of the instrument of the mind, body, and spirit as a weapon, but also training the adrenals to delay or be calm in the heightened reaction of an attack. Another great benefit to practicing Rou Shou is that you may further engage with many other internal martial artists such as practitioners of Taijiquan and Xingyiquan in their practice of Tui Shou (or Push Hands). Like Push Hands, Rou Shou also elicits listening energy, stickiness, and a great deal of confidence training in the power of less (or a combination of efficiency and exactness). Introducing and employing many of Baguazhang's timeless applications and practical defenses. Rou Shou has unfortunately been overlooked and even sacrificed in recent times for the integration of so called "mixed martial arts." If a practitioner needs to pull from this or that martial art, especially in internal arts, it's likely they missed the point of the training in their primary style. Heading down a path that may rely on unreal circumstances or environments (such as mats) are likely to ultimately limit your effectiveness. Particularly in the internal arts, tournaments tend to encourage developing "a bag of tricks and techniques" that can really "get somebody" in the short term instead of the concentrating on developing the internal fundamentals - such as softness and structure that can advance your practice over the long term. Eventually, the day comes when someone that has spent their time on developing tricks and techniques will encounter someone that has spent their time on developing the core practice of the art. Devoting practice time to tricks "puts the cart before the horse" since tricks and techniques simply will not work against an opponent that has progressed several levels further in the art. While Bagua has grown in popularity in movies and television as of late, the internal approach of Baguazhang (such as relaxing to move or using the least amount of stress and force) is becoming increasingly ignored. We offer some of the most comprehensive instructional materials on Baguazhang and Jiang Rong Qiao's Nei Jia Kung Fu available: From one of the best introductory books on Baguazhang, "Baguazhang Lianxifa" (Eight Trigrams Palm Practice Method) by Jiang Rong Qiao as translated by Joseph Crandall to our "Old Eight Palms" video series featuring Zou Shuxian, Jiang Rong Qiao's daughter. We also offer demonstration videos of Bagua's weapons, as well as a comprehensive instructional series on the Deer Hooks. In addition to Baguazhang materials, we have many Book and Video Combos on Chinese Internal Martial Arts and Chi Kung also available at the store, as well as in-depth information in text form throughout our site. New additions, include the rare 72 Leg Techniques of Bagua and Bagua's Power Training methods, including Zhangzhuang, Chi Kung, Training with Weight, Bricks, and Blocks, and Bagua' Push Hands.